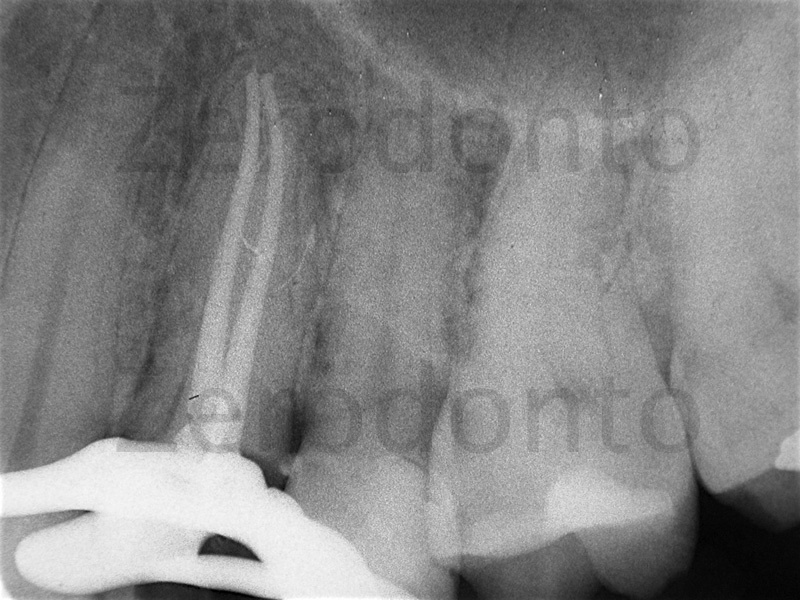 The endodontium consists of a space that is easily accessible to rotary and manual instruments (principal canals) and, as has been confirmed by numerous clinical and histological studies, there are spaces that are difficult to access or completely inaccessible (deltas, loops, isthmi, lateral and accessory canals, and dentinal tubules). 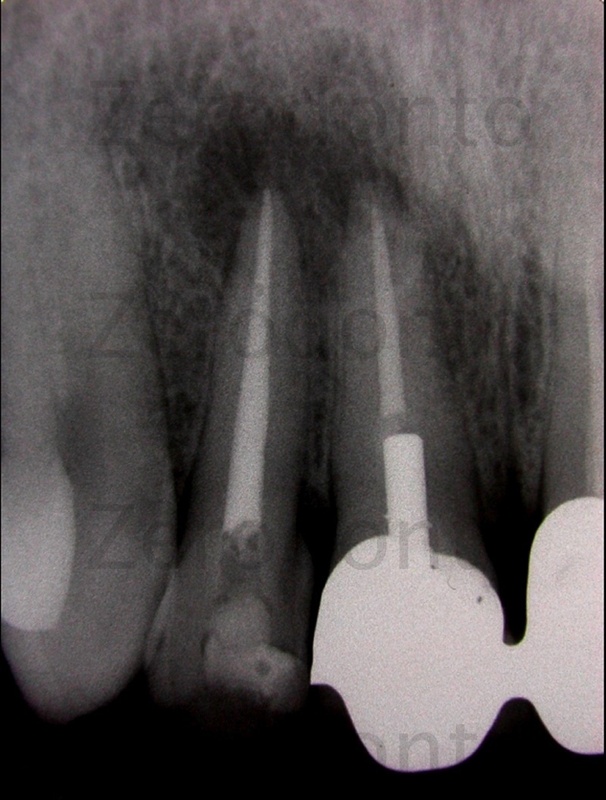 In particular lateral and accessory canals are found with significant frequency especially in the apical third of the root and in molar bifurcations. 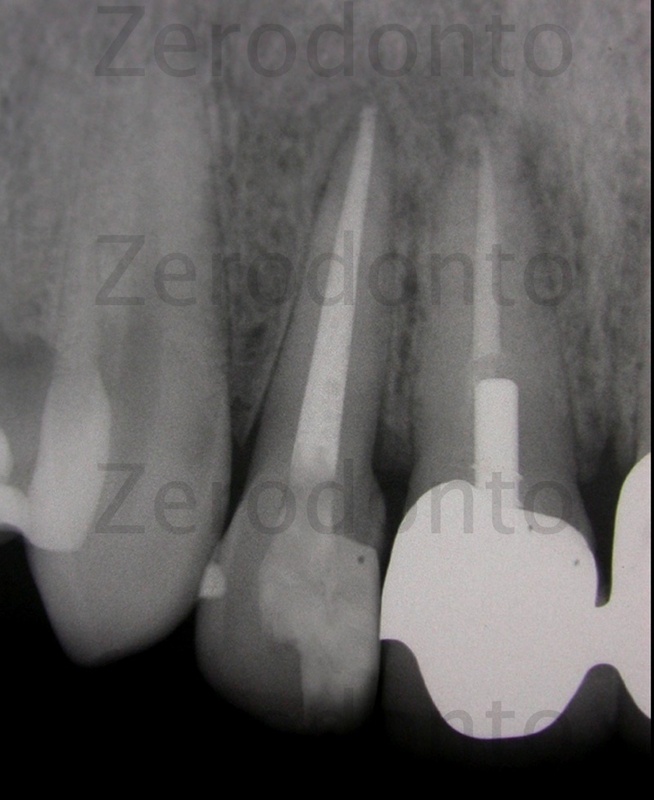 In the light of the above one of the most exciting challenges of modern endodontics is represented by the biochemical debridement of the endodontium (accessible and non accessible). 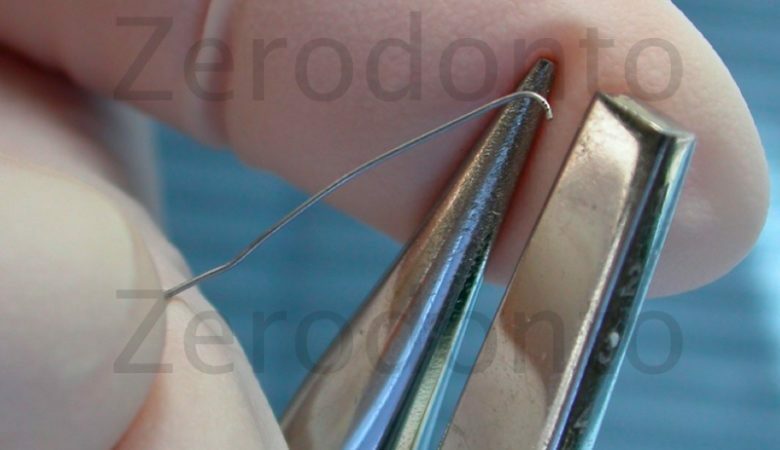 When debridement is performed according to the state of the art (three dimensional) cleaning, the endodontium can then be filled and sealed with cement and gutta-percha at the time of obturation. Irrigation, therefore, plays a crucial role in determining the outcome of root canal treatment. What irrigants should be used? A choice based on scientific evidence. I remember back in my university days, I once took my father to his dentist, a general practitioner, as he had to have root canal treatment. I was particularly struck by the frenetic rinsing with a sodium chloride solution alternated with hydrogen peroxide and asked why this procedure was performed. He answered that they had been taught to do it this way, without critically motivating his choice. In every field of medicine, the clinical practitioner must follow logic and must be supported by literature. The answer is simple; we want to eliminate the organic tissue (pulp), bacteria and toxins, as well as organic and inorganic debris that our rotary and manual instruments inevitably produce. At this point the choice is easy and natural. How do we irrigate the canals? of the irrigant in the pulp chamber. On the contrary the irrigant solution should penetrate the entire root canal system and it is essential that it cleanses those areas that our instruments cannot reach. 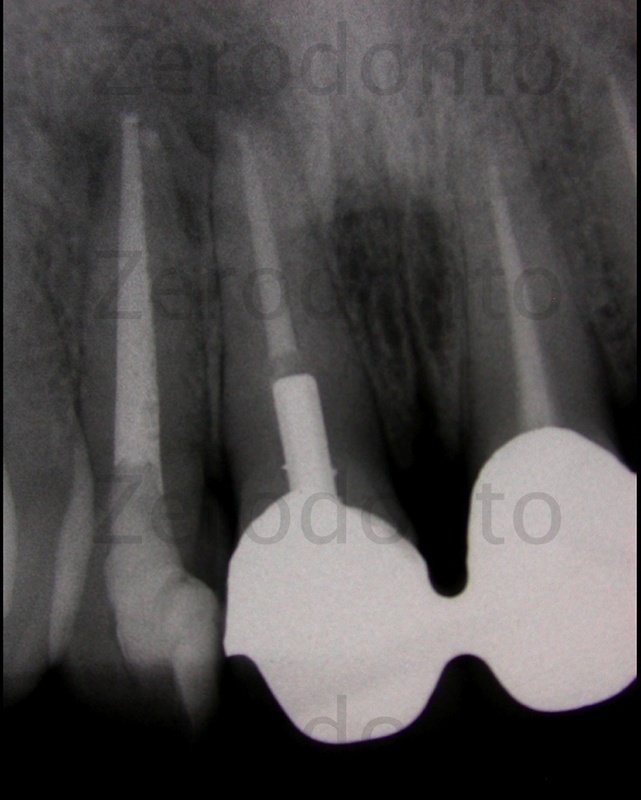 By doing this, the gutta percha, which becomes plastic due to the heat, is able to fill those spaces opened by the irrigants during the obturation phase. We should treat the entire root canal system in the same way as a surgeon removes entire areas of infection and inflammation; the irrigants are, therefore, an extension of our hands and our instruments. There is basically a choice between two approaches. The second, on the contrary, employs a new system of negative pressure in which the irrigant placed in the pulp chamber is drawn down inside the canal to be aspirated by a micro-cannula. 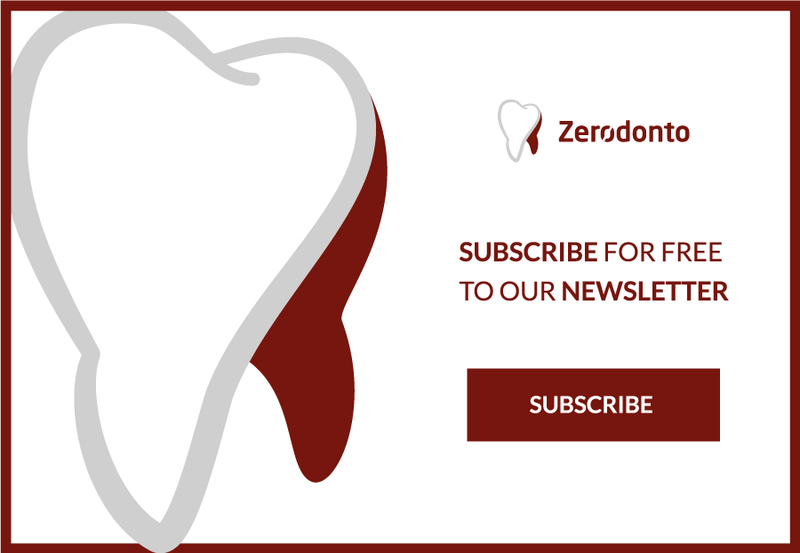 Whichever technique is used, the closer to the apical foramen the irrigant is deposited, the better the debridement will be. How long should we irrigate for? The irrigation time line is a topic of significant clinical relevance and has considerable implications for ergonomics in dental practice. 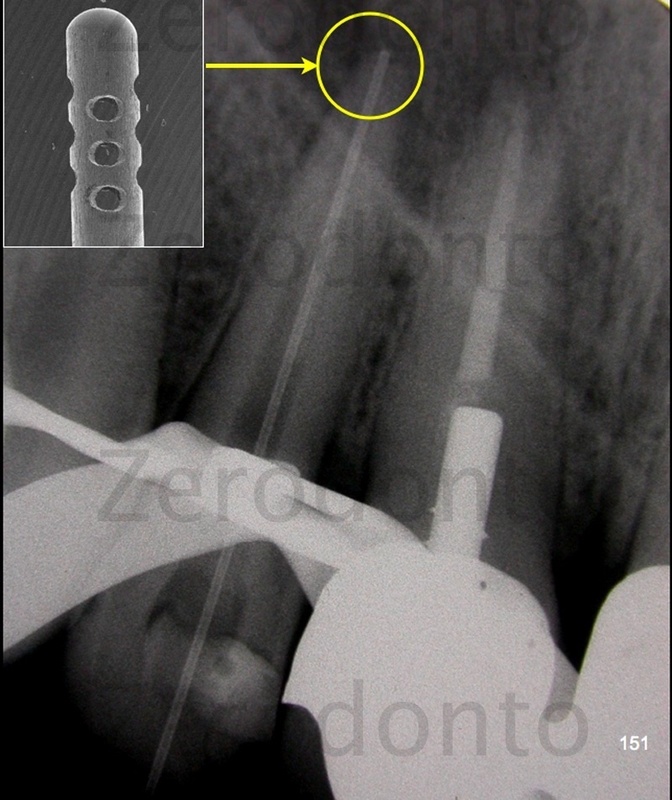 With the arrival of Ni-Ti in endodontics it is now possible to shape a canal in a very short time but this does not mean that the canals are ready for obturation and anyone who hurriedly obturates at the end of shaping, bypassing the irrigation phase or doing it for insufficient time, is making an error. Numerous recent failures are paradoxically due to the speed of shaping, after which irrigation is carried out for insufficient time. On the contrary is reasonable and profitable to invest the time saved with the rapid shaping carried out with nickel-titanium instruments, in biochemical debridement procedures that will raise the quality of the root canal treatment. It is rather the opinions of brilliant clinicians that guide us. In conclusion I would like to repeat this concept: even on a Friday afternoon when you are treating the last patient and your mind is on the coming weekend and the shaping was particularly easy and fast, resist the temptation to immediately obturate the canals if you have not irrigated them sufficiently. Therefore walk around the practice, do some stretching, have a coffee or why not phone a colleague or friends, answer your e-mail… and rest assured that the irrigants are working for you inside the canals! Ten years ago one of my best friends developed a severe pain localized around the upper right lateral incisor and so I treated him for the emergency in my practice. 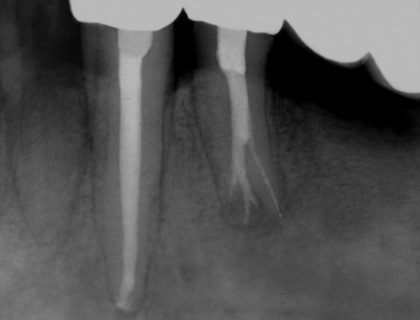 Acute peri-apical periodontitis was diagnosed and a radiograph evidenced a previous incongruous root canal treatment that barely reached half way up the root with a small peri-apical radiolucency. We decided to schedule treatment for the following day. Right from the beginning I realized that the canal was very large and fortunately patent under the root filling, so determining the correct working length and shaping the whole canal was very easy and fast. This case was probably the easiest I had treated up until then, so I hastily irrigated with sodium hypochlorite, convinced (wrongly) that in a large canal like this one, the irrigant would also exert its disinfecting action rapidly. 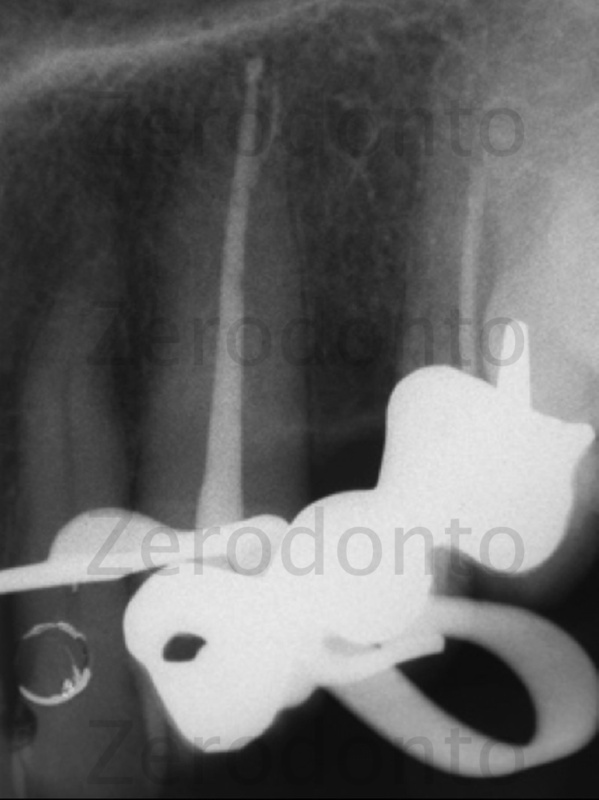 After this I obturated the canal with warm vertical compaction using gutta percha and cement. 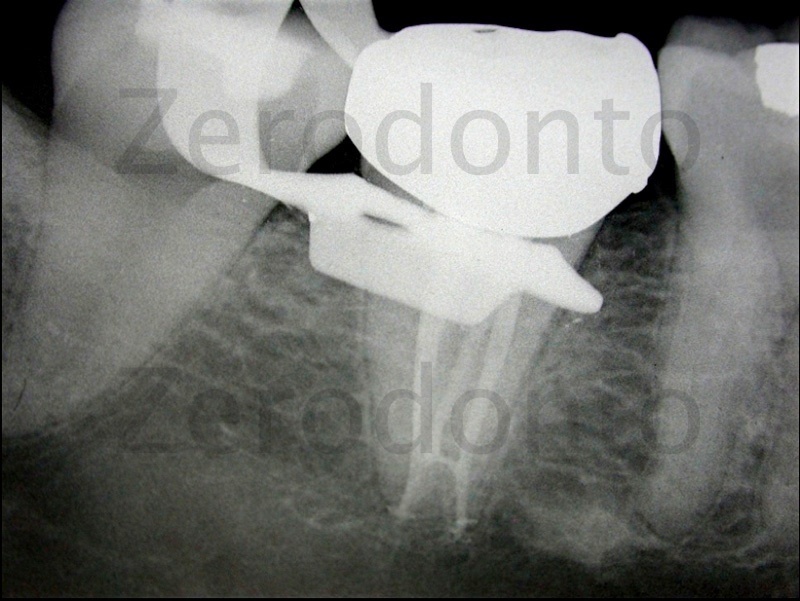 Figure 2: Pre-operative radiograph which, notwithstanding the obturation appearing to be correctly completed, highlights a large periapical lesion which is larger than it was 6 years before. Insufficient penetration of the irrigant to the apical third? Profoundly disillusioned and sorry, I prescribed antibiotics and a week later I performed a second retreatment on the tooth. This debris probably prevented the cement and gutta percha from filling the canal three dimensionally. Figure 3: GT 40-.08 rotary file with grooves filled with infected debris. 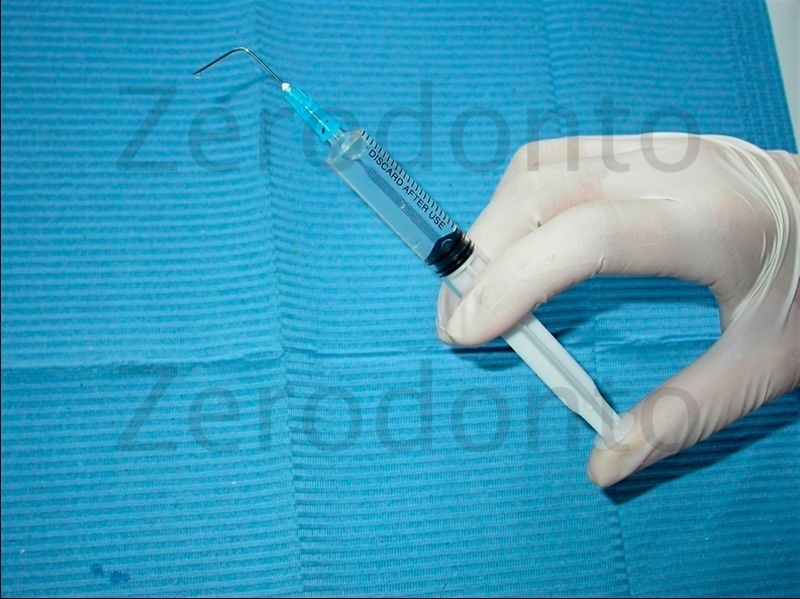 This type of irrigation technique is carried out by placing the irrigant solution in the pulp chamber which is then drawn down by the micro-cannula inside the canal all the way to the tip of the micro-cannula. Figure 4: Determining the working length. 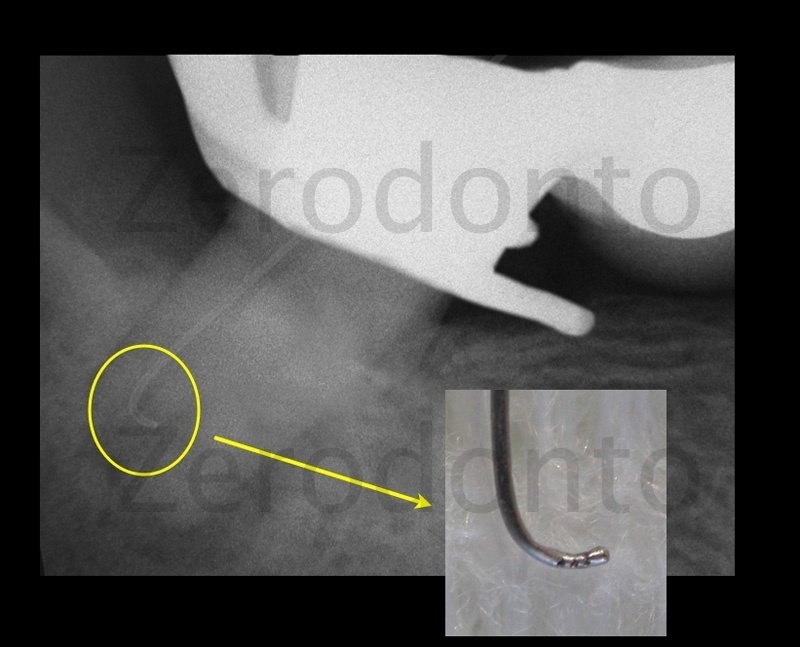 I used a steel micro-cannula as a verifier (being hollow it is less radio opaque than a K-file in the x-ray) to demonstrate that the irrigation was carried out safely up to the apical foramen, because it is a negative pressure technique. Figure 5: Warm vertical obturation. Radiographic check up carried out at one year shows a definite improvement and check up at three years shows the complete resolution. Figure 6: Check up at one year: definite improvement with reduction of the radiolucency. Figure 7: Check up at three years: the case with complete resolution. 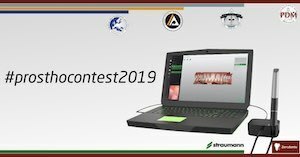 This case shows that allowing sufficient time for canal irrigation, as well as the importance of enriching your endodontic equipment with new technology dedicated to irrigation, is an intelligent strategy. viruses and spores, destroying them. Similarly a calcium chelating agent such as EDTA 17% shows that it is perfectly capable of removing the inorganic component of the smear layer coating canal walls after dentin is cut during shaping. So then why should we potentiate the irrigant? 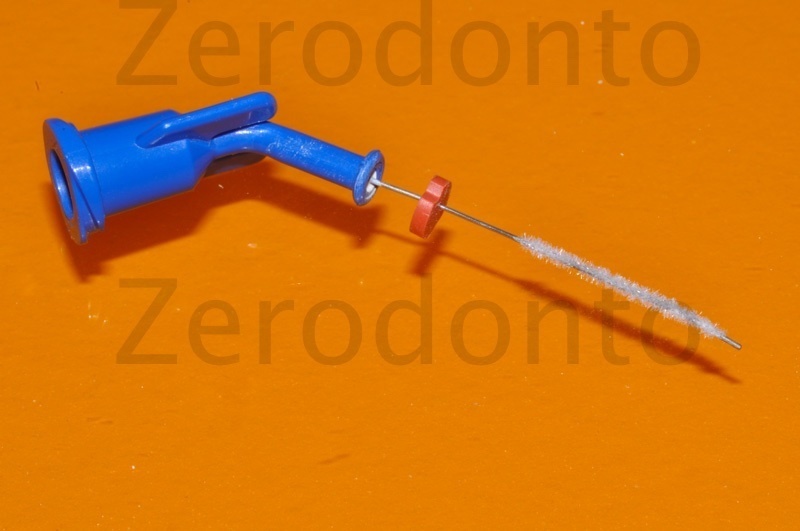 The technique of potentiating with ultrasonic or subsonic instruments is often suggested by some clinicians and researchers firstly to accelerate and improve the biochemical reaction between the irrigant and the substrate and secondly to mobilize the irrigant because they are afraid that it might not penetrate the whole canal surface including the endodontium that cannot be probed. Instruments dedicated to cleansing, like thin flexible needles or aspirating micro-cannulas, are now available so distributing the irrigant solutions throughout the canals should no longer be considered a problem; the question that needs resolving is another one. there was an instrument that could rapidly detach it then our irrigants would immediately act at the surface level of the canal walls which are now “naked”. This instrument should, amongst other things, act at the level of the canal walls without producing further debris. I would like to make a quick digression. A glaring example of ergonomics can be described by tasks facing housewives, many which have to be carried out, done well and as quickly as possible. One of the things they have to do is to remove the grease from dirty dishes and pots. To do this they don’t just use washing up liquid, but scrub the surface with a sponge and brushes so that it is more effective. Similarly endodontists must not just deposit the hypochlorite in the canals expecting it to miraculously remove the layer of debris from the canal walls, disinfect them and even penetrate inside the lateral canals, the apical delta and the dentinal tubules! At the end of the shaping, during the irrigation with hypochlorite and EDTA, I move these self-made brushes up and down in a scrubbing motion to detach the debris from the canal walls. From a clinical point of view this gives me great satisfaction because I noticed that the irrigant becomes cloudy after this brushing, showing that the debris is released and how effective this method is. Figure 8: Dedicated irrigation needle with bristles: using a laboratory disk I remove the last two mm without bristles as well as the plastic attachment, and then I fit a silicon handle. Figure 10: Detail of the bristles used to free the debris spread on the canal walls. Figure 11: The brush has a steel core so it can be bent. 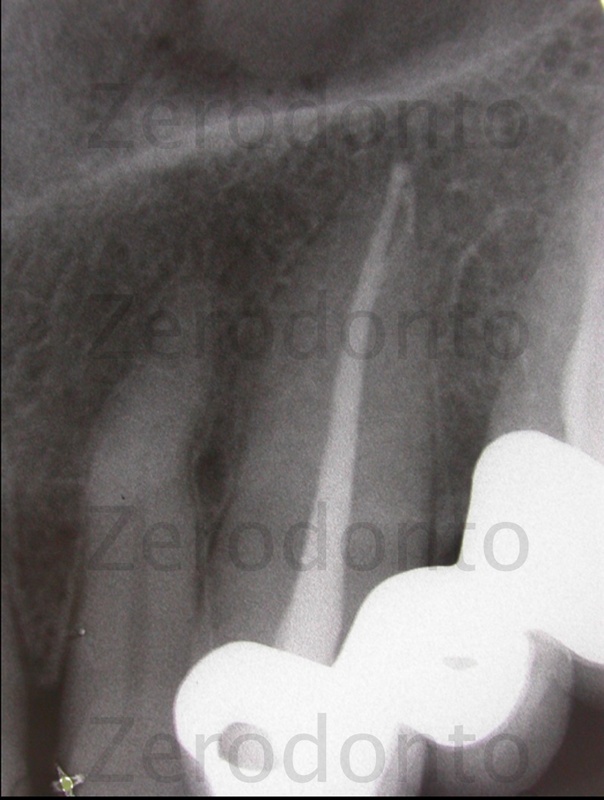 The difficulty with endodontics is generally the last few millimeters of the canal, in other words the apical third where more than 90% of the portals of exit are located. The apical third is by nature narrow and deep and so it has to be adequately rinsed with the irrigant solutions. 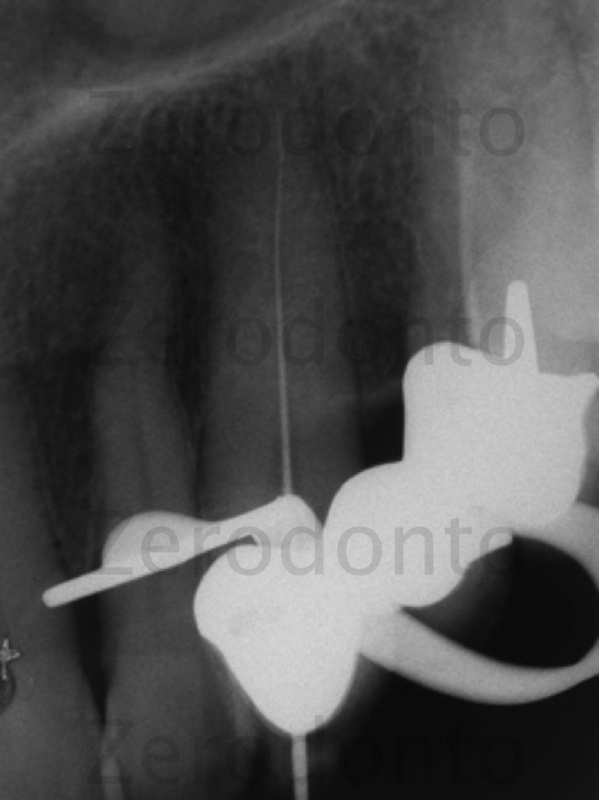 One of the imperatives of endodontic irrigation is the renewal of the irrigant in the deeper portion of the canal, the apical third. Indeed, because of the significant buffering capacity of dentine, the irrigant loses its effectiveness after a while and it has to be renewed. Having identified the necessary of not only reaching but also renewing the irrigant in the apical third, to complicate matters we also have the canal anatomy. The canal anatomy limits every part of the root canal treatment, including irrigation. Indeed the difficulty is compounded if the apical third is found at the end of a long or narrow canal or worse still after a curve, in other words with anatomy like this, where shaping and obturation are both difficult, irrigation is difficult too. 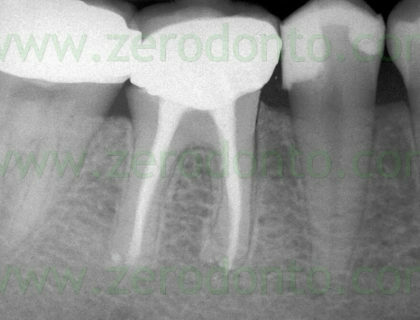 Figure 12: Lower molar bridge abutment with acute apical periodontitis; you can see the peri-apical radiolucency. 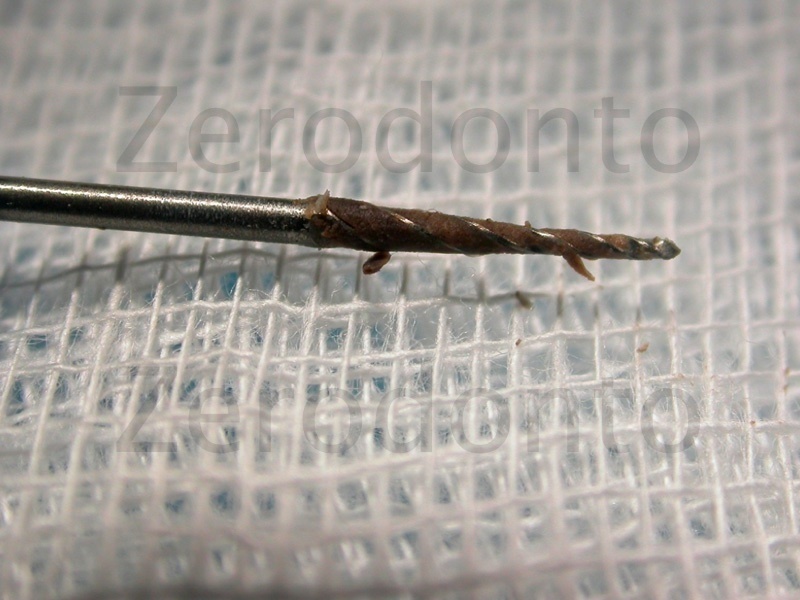 Figure 13: The distal root has an unexpected curve in the last 3 mm. The apical third was, therefore, shaped using manual instruments alone: firstly K-files and then GT hand files bent with the EndoBender pliers used to bend the files without damaging the blades. Figure 14: Detail view of a GT hand file with a 10% taper. 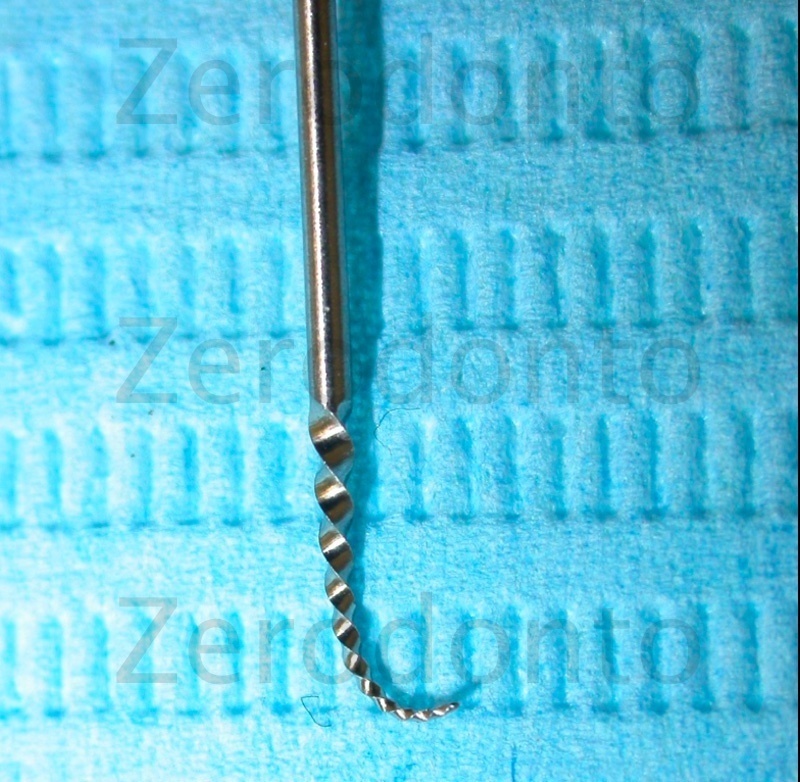 Figure 15: Irrigation needles, like other root canal instruments, can also be bent to follow the curves in cases with a complex anatomy, in order to deposit the irrigant in areas which are otherwise hard to reach. In this case an aspirating micro-cannula was bent so that it could be placed at the foramen. The negative pressure draws the irrigant solution down past the curve up to the apex without the risk of the dangerous extrusion of the irrigant into the tissues. 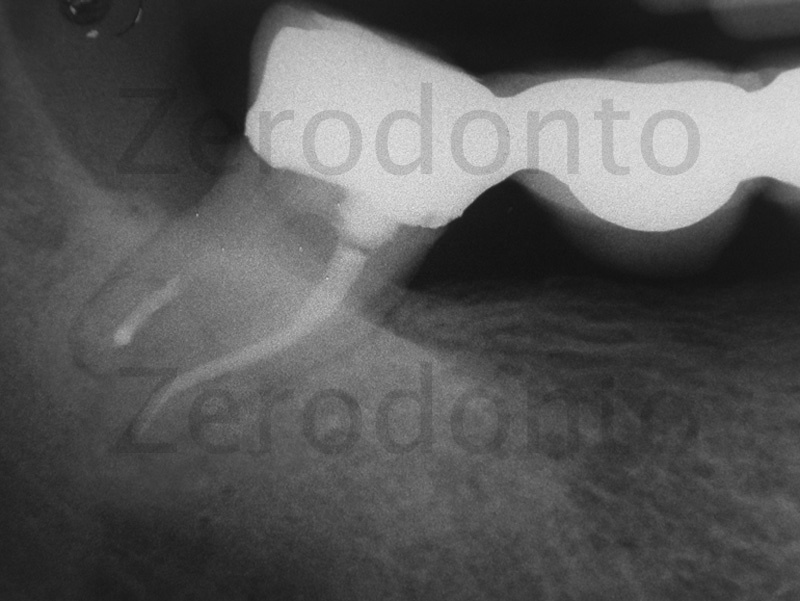 Figure 16: Radiograph of micro-cannula at the apex in the distal root. You can see how much the last few mm is curved. Figure 18: Check up at 1 year, oblique projection, the case has healed. Figure 19: Check up at 1 year, straight projection, no radiolucency noted. 1- Before introducing an instrument into the canals and therefore after opening the pulp chamber, rinse with 6% sodium hypochlorite. 2- Remove excess hypochlorite and place EDTA gel in the pulp chamber to act as a lubricant and to facilitate manual instrumentation. Another important function is to prevent the pulp tissue from forming a plug in the canal due to it being compacted by the downward movement of the instruments. 3- Copious irrigation with sodium hypochlorite after use of each rotary instrument. 4- At the end of the shaping, dry and proceed by rinsing with liquid EDTA 17% for 5 minutes (renewing every 2 minutes). 5- Dry and perform final abundant rinsing with hypochlorite renewing frequently in the deeper areas. 6- Take note of the clinical signs that would indicate a need to increase the irrigation time. The development of bubbles on the inside of the hypochlorite solution could indicate “digestive” action on the organic residue still taking place and would require an increase in the time that the irrigant should be left in the canal. Figure 20: Upper canine with pulpitis. Figure 21: A 0.20 K-file at full working length. Figure 22: Paper point marked laterally with blood at the end of treatment made me suspect the presence of lateral canals and suggested that I should increase the irrigation time. 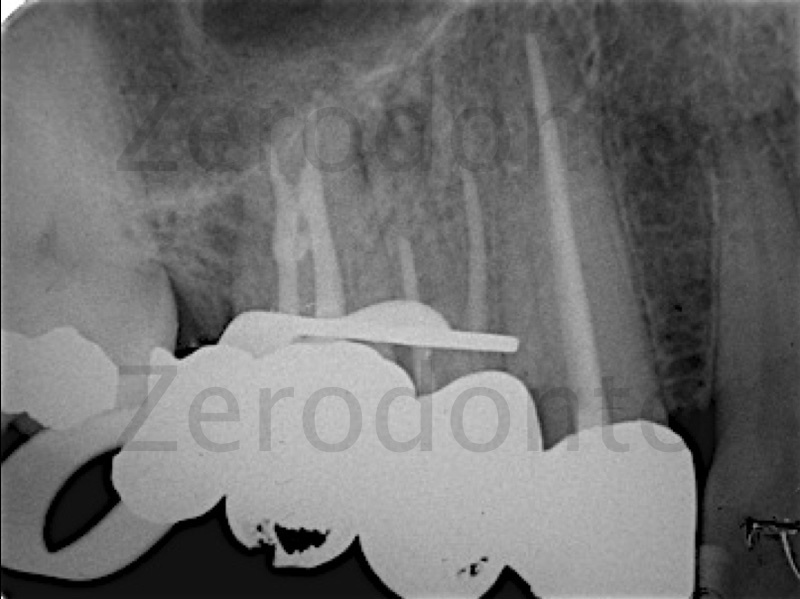 Figure 23: Warm gutta percha and cement fill the entire root canal system confirming the complexity of the anatomy and the presence of a lateral canal. Figure 25: Check up at 6 months, no radiolucency noted. I heat the hypochlorite for 3 seconds at 200°using the finest System-B heat plugger, trying not to touch the root canal walls. I do this four to five times while my assistant aspirates the vapor. I consider this technique particularly useful to digest the organic debris that could remain after root canal treatment where the canals merge and in the irregularities of a complex C-shaped anatomy. 8- Rinse with pure alcohol and dry with paper points to dehydrate the root canal. 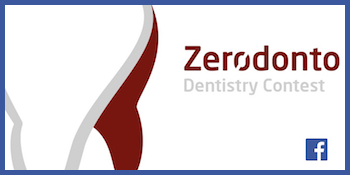 Scrupulous and patient debridement raises the quality of the whole treatment and lays a solid base for ultimate successful root canal treatment. 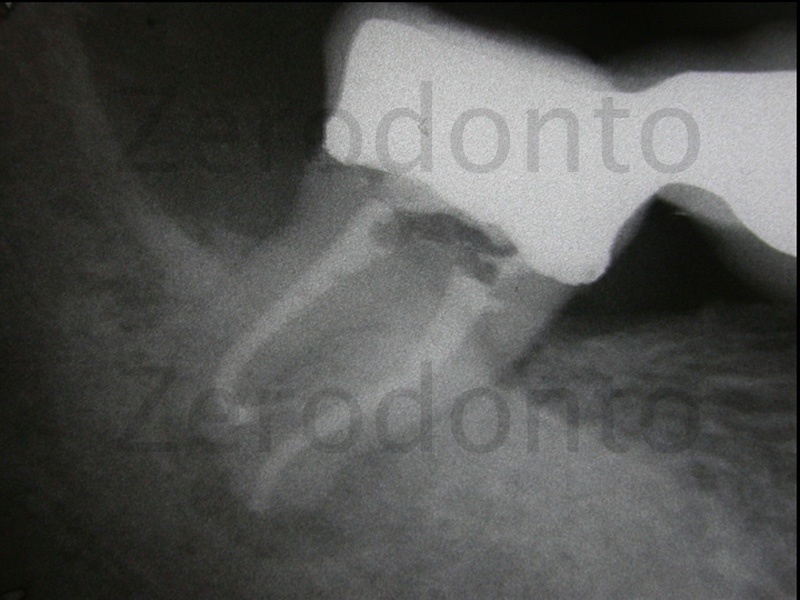 Figure 26: Second lower molar treated for pulpitis. 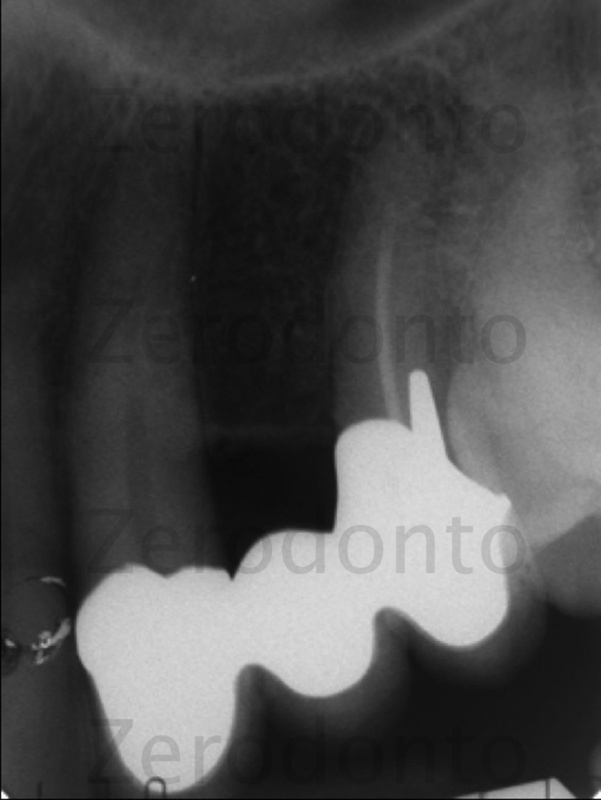 The x-ray shows a large anastomosis between the mesial and distal part of the c-shaped canal. 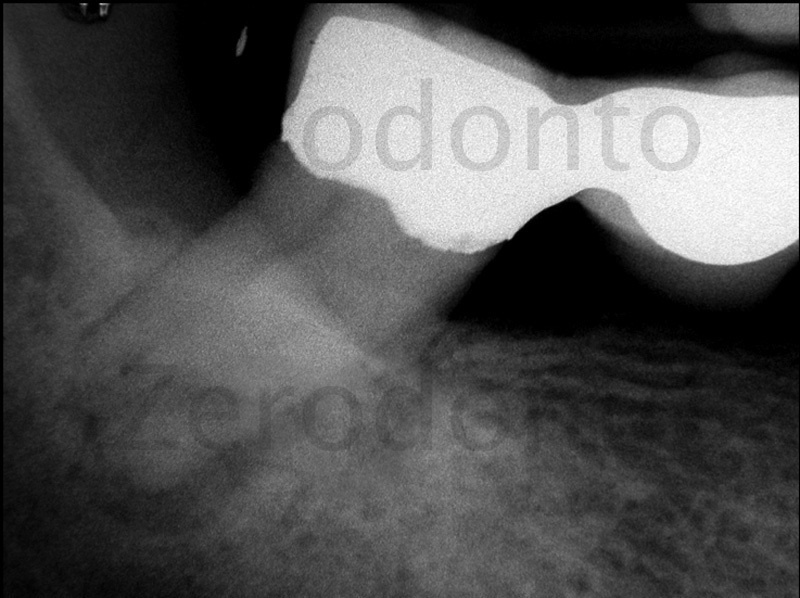 Figure 27: First upper premolar treated for pulpitis. 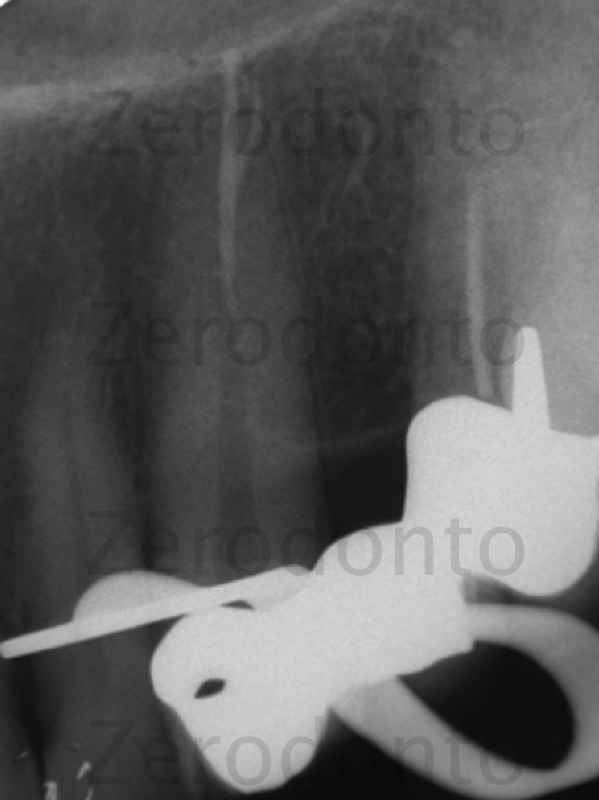 The x-ray shows anastomosis in the middle and apical third. 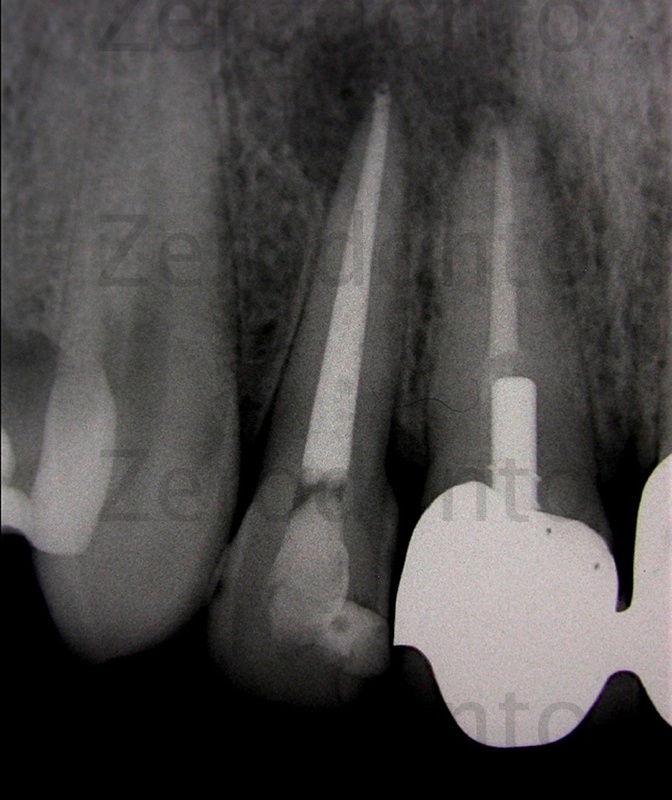 Figure 28: Re-treatment of a second upper premolar for acute apical periodontitis. The x-ray shows anastomosis in the middle and apical third and an irregular anatomy. 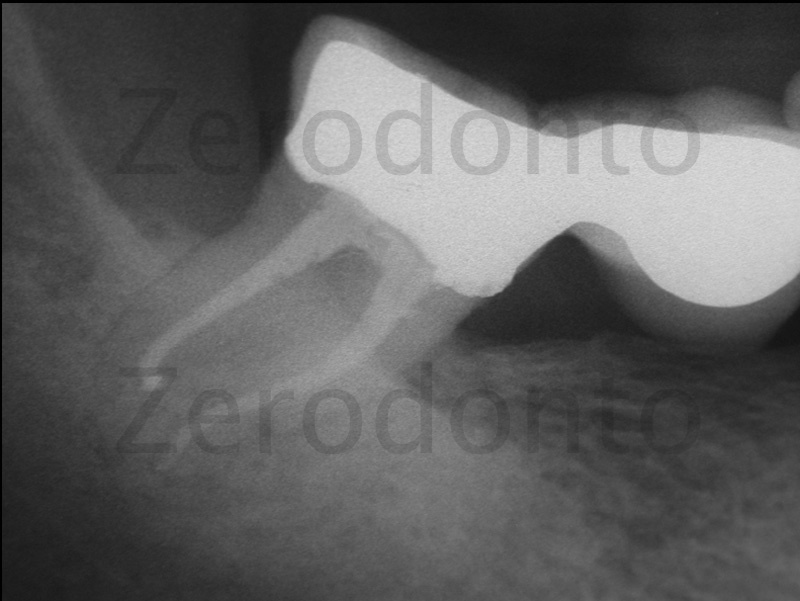 Figure 29: The x-ray shows a second lower molar with long anastomosis between its mesial and distal part. 3. Nair PN. On the causes of the persistent api- cal periodontitis. A review. Int End J 2006 Apr;39(4):249-81. 4. Gulabivala K, Patel B, Evans G, Ng Y-L (2005) Effects of mechanical and chemical procedures on root canal surfaces. 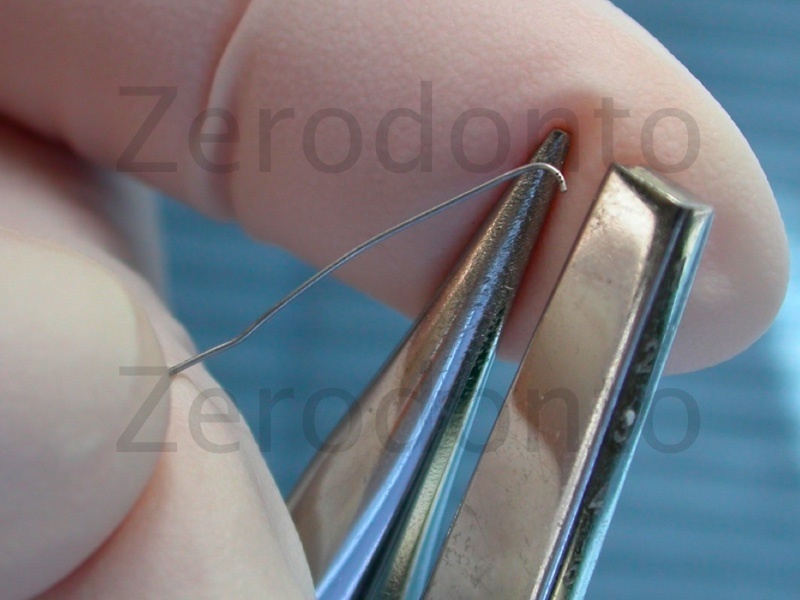 Endodontic Topics 10, 103–22. 5. Senia ES, Marshall FJ, Rosen S. The solvent action of sodium hypochlorite on pulp tissue of extracted teeth. Oral Surg Oral Med Oral Pathol 1971;31:96–103. 6. Moorer WR, Wesselink PR. Factors promot- ing the tissue dissolving capability of sodium hypochlorite. Int Endod J 1982;15:187–96. 8. 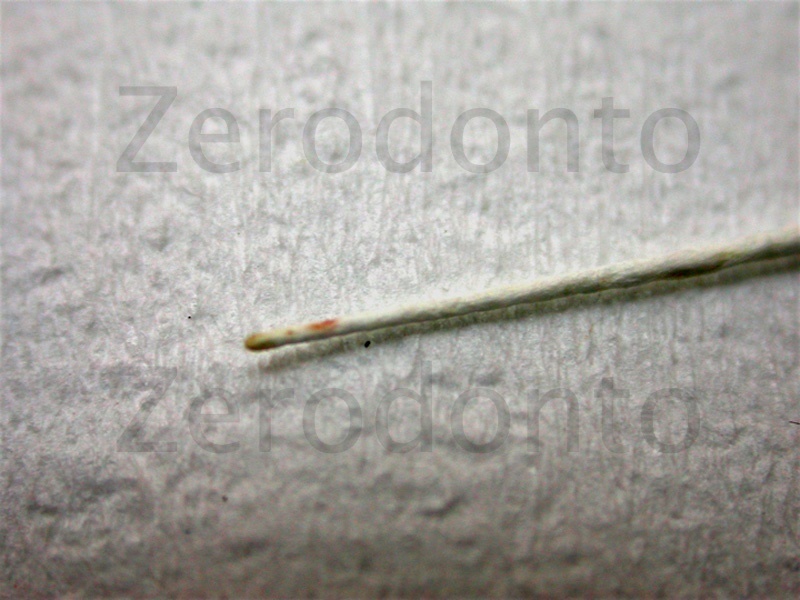 Naenni N, Thoma K, Zehnder M. Soft tissue dis- solution capacity of currently used and potential endodontic irrigants. J Endod 2004;30:785–7. 9. Harrison JW, Hand RE. The effect of dilution and organic matter on the anti-bacterial prop- erty of 5.25% sodium hypochlorite. J Endod 1981;7:128–32. 12. Guerisoli DMZ, Marchesan MA, Walmsley AD, Lumley PJ, Pecora JD. Evaluation of smear layer removal by EDTAC and sodium hypochlo- rite with ultrasonic agitation. Int Endod J , 35, 418–421, 2002. 13. Yoshida T, Shibata T, Shinohara T, Gomyo S, Sekine I. 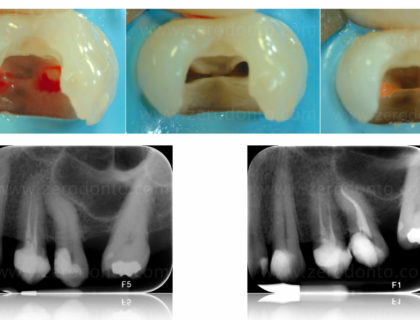 Clinical evaluation of the efficacy of EDTA solution as an endodontic irrigant. J En- dod 1995;21:592–3. 14. Hülsmann M, Heckendorff M, Lennon A. Chelating agents in root canal treatment: mode of action and indications for their use. Int Endod J 2003;36:810 –30. 15. 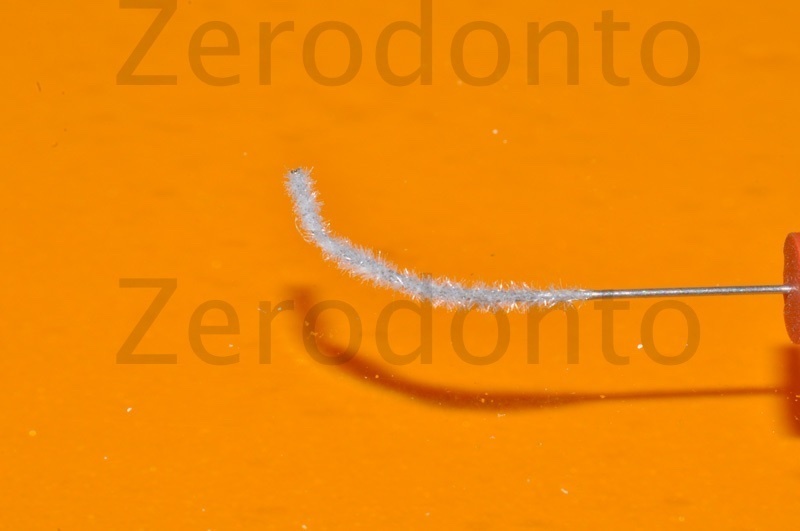 Naenni N, Thoma K, Zehnder M. Soft tissue dis- solution capacity of currently used and potential endodontic irrigants. J Endod 2004;30:785–7. 16. Zamany A, Safavi K, Spångberg LS. 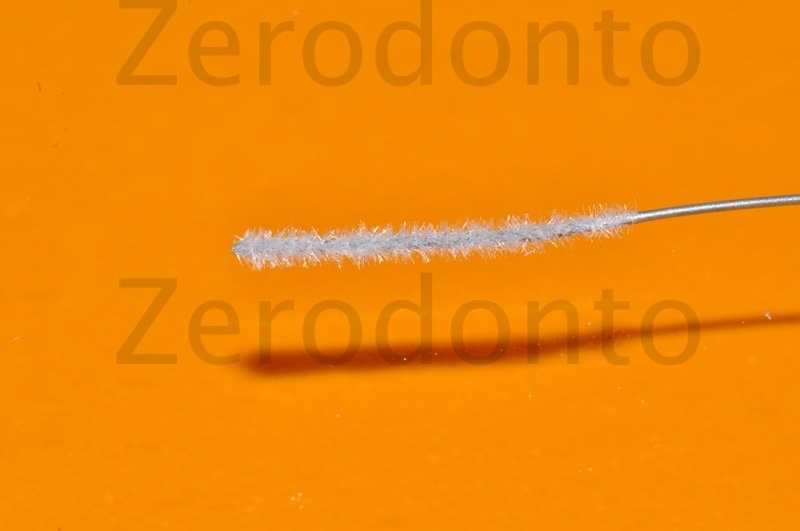 The effect of chlorhexidine as an endodontic disinfectant. Oral Surg Oral Med Oral Pathol Oral Radiol Endod 2003;96:578–81. 18. van der Sluis LW, Gambarini G, Wu MK, Wes- selink PR. The influence of volume, type of irrig- ant and flushing method on removing artificially placed dentine debris from the apical root canal during passive ultrasonic irrigation. Int Endod J 2006;39: 472–6. 19. Nielsen BA, Baumgartner JC. 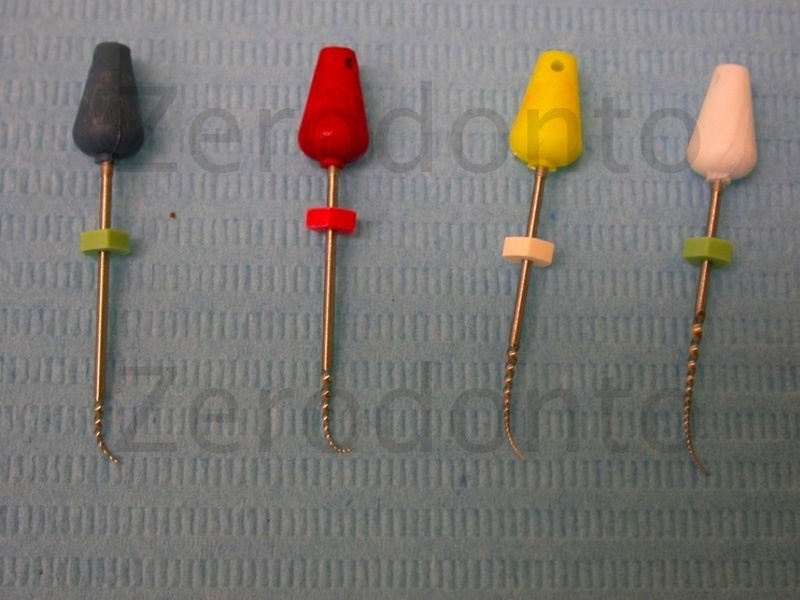 Comparison of the EndoVac system to needle irrigation of root canals. 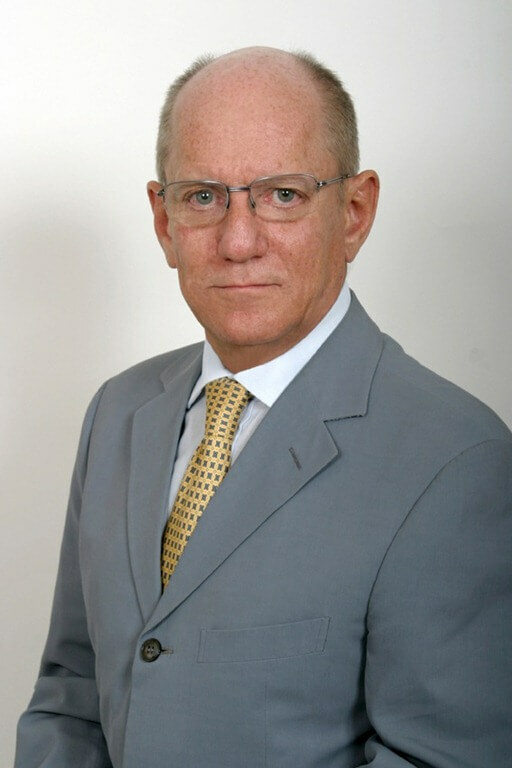 J Endod 2007;33:611–5. 22. 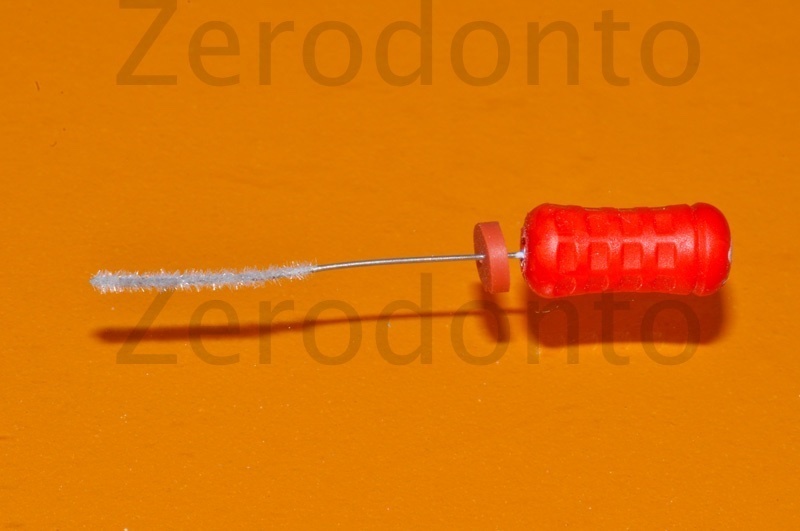 Zehnder M. Root canal irrigants. J Endod 2006; 32:389-39. 23. HYPERLINK “http://www.ncbi.nlm.nih. gov/pubmed?term=%22Buchanan%20 LS%22%5BAuthor%5D”Buchanan LS. 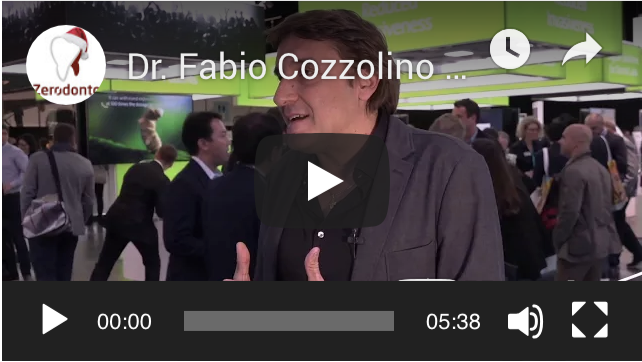 Ahead of the curve: future directions in endodontics. Dent Today. 2009 Apr; 28(4):110,112,114. 24. Woodmansey KF . Intracanal heating of sodium hypochlorite solution: an improved endodon- tic irrigation technique. Dent Today. 2005 Oct;24(10):114, 116. 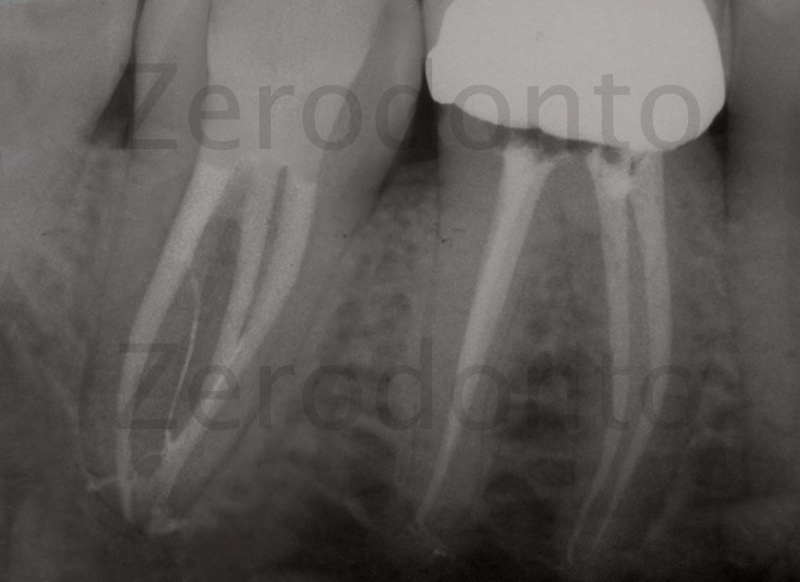 Irigation or coronary sealing of the tooth?